First published on Sky News on 30th May 2010. Bright pink magnolias, deep red roses, lush green grass, pergolas that Charlie Dimmock would be proud of and even the odd water feature. 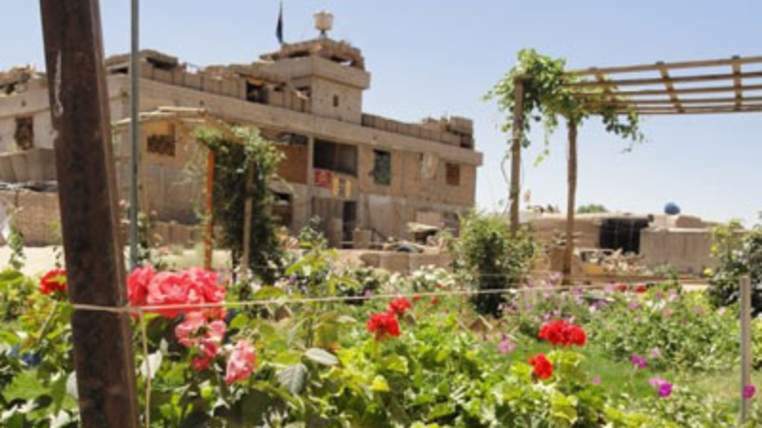 No, this is not a lovingly manicured English country garden, this is thousands of miles away in one of the most dangerous places in the world – Sangin, Helmand Province in Afghanistan. In 50C heat, British troops are doing their laundry in basins by the river during a few precious moments of “personal admin” time on the Forward Operating Base. Others are catching up on reading, preparing for their next patrol or having a blissfully refreshing dip in the Sangin river. But for their Afghan National Army counterparts, it seems nothing beats a spot of gardening. Just a few metres away from rows of armoured vehicles and pockmarked buildings stuffed with sandbags, the Afghan soldiers have created an incongruous oasis that stands out from its hard, dry, dusty, beige surroundings. They are meticulous about watering their flower beds and lawns and coaxing creepers over gateways and walls. And it seems civilian Afghans are no less green-fingered. Roads and tracks through Sangin are bordered by large allotments of intricately irrigated land. One soldier told me as we patrolled past an embryonic orchard that they are also streets ahead of us at genetically combining different fruit trees. So it seems the English may have competition in the gardening stakes… and an unexpected hobby in common with the Afghan people. This entry was posted in Afghanistan and tagged adventure, Afghan National Army, Afghanistan, Afghans, Army, Bastion, British Army, BSKYB, extreme gardening, Forward Operating Base, gardening, green fingers, Helmand, patrol, patrol base, Sangin, soldiers. Bookmark the permalink.